Step 1 Mix the chicken with the lime juice, chilli powder and garlic. Step 2 Heat the oil in a non-stick frying pan then fry the chicken for a couple of mins – it will cook very quickly so keep an eye on it. Meanwhile, warm the wraps following the pack instructions or, if you have a gas hob, heat them over the flame to slightly char them. Do not let them dry out or they are difficult to roll. 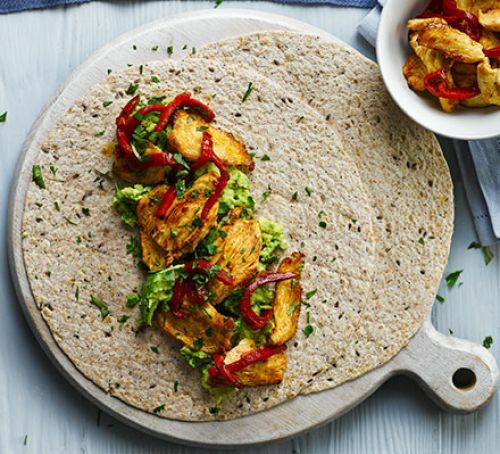 Step 3 Squash half an avocado onto each wrap, add the peppers to the pan to warm them through then pile onto the wraps with the chicken, and sprinkle over the coriander. Roll up, cut in half and eat with your fingers.